Learn how you can launch a profitable business as a creative entrepreneur and gain the financial and professional freedom you want. Besides financial independence, I have discovered many couples also want creative freedom when it comes to their careers. For some, getting their financial freedom leads to have the resources to make the leap while others take the opposite approach – they use their talents to work their way towards financial independence. I’ve written a few times about the joys and work of freelancing and on occasion, I’ve shared resources that I think those looking to start their business would appreciate. One of my favorite freelancers – Chris Guillebeau has taken it one step further by not only writing on how he made the leap, but he’s also been collaborating with others to dissect how to start a profitable business. 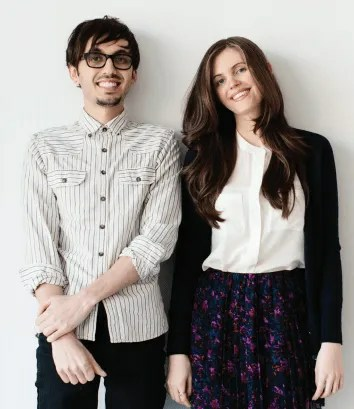 Designed to Sell is the most recent release and Jen Adrion and Omar Noory, the illustration duo and owners of These Are Things, are the voices behind it. They are a great choice to head this new project as they have personally have started a thriving business that has included international clients such as 3M, American Greetings, Rodale, and T. Rowe Price. Starting with their modern world map, the creative pair have grown and developed their business to suit their needs. What’s Included in Designed to Sell? Jen and Omar have compiled and organized resources to create a thorough guide for the creative entrepreneur. Designed to Sell – A 130 page manual that walks you through you from finding a profitable business idea that aligns with your talents, starting a business, and expanding it at your pace. You can preview the book here. Roadmap to Creative Freedom -A handy checklist to help you stay on top of your tasks. Creative Business Directory – No business is an island Jen and Omar share some wonderful tools, services, and suppliers to start and grow your business. For those looking for even more material, there are even more resources including audio interviews, video interview where Jen and Omar share all their mistakes so you can avoid repeating them, pricing toolkit, pitch samples and templates, and more. If you’re interested, please check it out here and choose the edition that fits your needs. The main guide is divided in five sections. Your Big Idea: The first section dives into refining your idea and turning it into a viable business. Creativity and Cash: Setting up the business means making it official with proper bank accounts, budgets, and fundraising in some cases. Open for Business: Jen and Omar go into e-commerce business platforms and getting the launch ready. Spread the Word: With your product or service polished for launch, it’s time to spread the word. The Road Ahead: The last section covers expanding your business without losing control. As you can see this from the topics covered, Omar and Jen give a fairly detailed road-map on starting a profitable and creatively oriented business. Is Designed to Sell Right for You? Like most of Chris’ projects, this guide is not everyone. Designed to Sell is for entrepreneurs who are willing to put in the effort to start a real and sustainable business. It’s more than’ find your passion, start a business’ – it is about using your talents in a way that fills a specific need that customers are willing to pay for. That success takes careful thought and it means making significant efforts. There is really no way around – you have to be willing to work to start a business and grow it. Designed to Sell is a guide that can help you make the transition. It’s not the only way to be a creative entrepreneur, I just think it’s a concise guide that can help you. If you do want to grab a copy for yourself, you can do so here. For those who are on a smaller budget or you just want to test out the waters, you may want to check out The $100 Start-Up. It’s a wonderful book that can help you jump start your side business. You may be able to get it at your local library, which makes it an even better deal. Disclosure: If you purchase the guide through our affliate links, you’re supporting Couple Money; thank you!